The level of a tariff that maximizes a country's welfare. In a nondistorted small open economy, the optimal tariff is zero. In a large country it is positive, due to its effect on the terms of trade. Normally, when a tariff is imposed, the terms of trade improve and gain accrues to the imposing country. But the tariff rate should be within a limit. If excessive tariff is imposed total gain resulting from improved terms of trade will not be large enough due to decline in the volume of trade. Hence, the question arises as to what should be the ideal rate of tariff? In this regard economists have devised the concept of 'optimum tariff.' 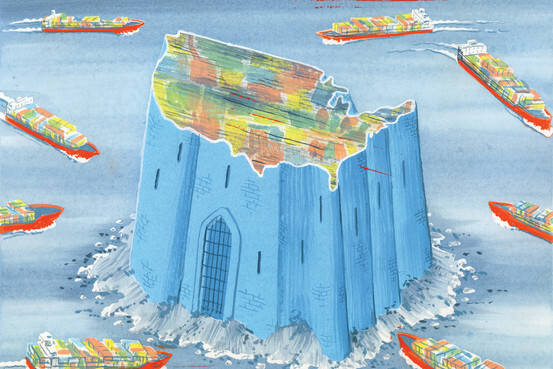 The optimum tariff is one which maximises imposing country's gain or welfare from trade. 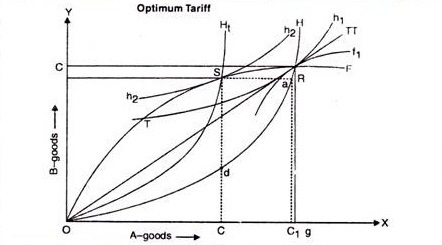 In technical jargon, however, optimum tariff implies that rate of tariff which intersects the opposite country's offer curve at a point which is tangent to the imposing country's highest community indifference curve. In the absence of retaliation, a country should be able to levy a tariff on imports which yields some optimal terms of trade and hence an optimal level of community welfare. Beginning at the free trade position (or any tariff- distorted trade position) as a country raises its tariff unilaterally, the terms of trade improve and the volume of trade declines. The improvement in the terms of trade initially, tends to more than offset the accompanying reduction in the volume of trade and hence a higher trade indifference curve is reached and community welfare is enhanced. Beyond some point, however, it is likely that the detrimental effect of successive reductions in trade volume will begin to outweigh the positive effect of further improvements in the terms of trade so that community welfare begins to fall. Somewhere in between there must be a tariff which will optimize a country’s welfare level under these conditions. The following figure explains the existence of some optimum tariff level. (R) is free trade equilibrium. At that point the volume of trade is og of A-good and oc of the B-good, and the terms of trade are given by the slope of line TP. The home country (II) now wishes to impose a tariff that will maximize its community welfare, i.e. place it on the highest possible trade indifference curve assuming no retaliation on the part of the foreign, country. Under free trade conditions at (R) country (H) attains the trade indifference level (h1) which crosses the foreign offer curve (OF) at (R) and at some other point (T). Any tariff which distorts the home country’s offer curve in such a way that it crosses the foreign country’s offer curve between points (T) and (R) will lead to a higher trade indifference level. If the new tariff distorted point is at (T), of course, the trade indifference level will be unchanged. The highest possible trade indifference curve that the home country can reach is one that is tangent to the foreign offer curve. This is trade indifference curve (h2) tangent to foreign offer curve OF at point (s). Hence, if the home country can impose a tariff of such magnitude that the tariff distorted offer curve (OHt) touches the foreign offer curve (OF) at point (s); this is the optimum tariff (sd). Given the foreign country’s offer curve, the optimum tariff, in terms of A-good is quantity (Sa) or in terms of B-good, quantity (Sd). This is the optimum tariff. Given the foreign country’s offer curve OF, there is no tariff the home country can impose that will yield a higher level of community welfare. The magnitude of optimum tariff depends upon the elasticity of foreign offer curve. If the foreign offer curve is perfectly elastic, no tariff will yield the home country improved terms of trade. Hence it cannot possibly advance to a higher trade indifference level. The less elastic the foreign offer curve, the higher will be the optimum tariff. Where the foreign offer curve has elasticity of one and thus is horizontal, the optimum tariff will be infinity. In actuality the probability is that the foreign country will retaliate against the home country’s imposition of an optimum tariff since it is thereby placed on a lower trade indifference curve. Hence, the foreign country may itself levy an optimum tariff that crosses the home country’s tariff distorted offer curve at point which yields the foreign nation a maximum trade indifference level. Then the home country may counter retaliate with another optimum tariff and the tariff war process takes its usual course.